URGENT PRODUCT RECALL - PETSAFE - News - Prestige Pet Products Pty. 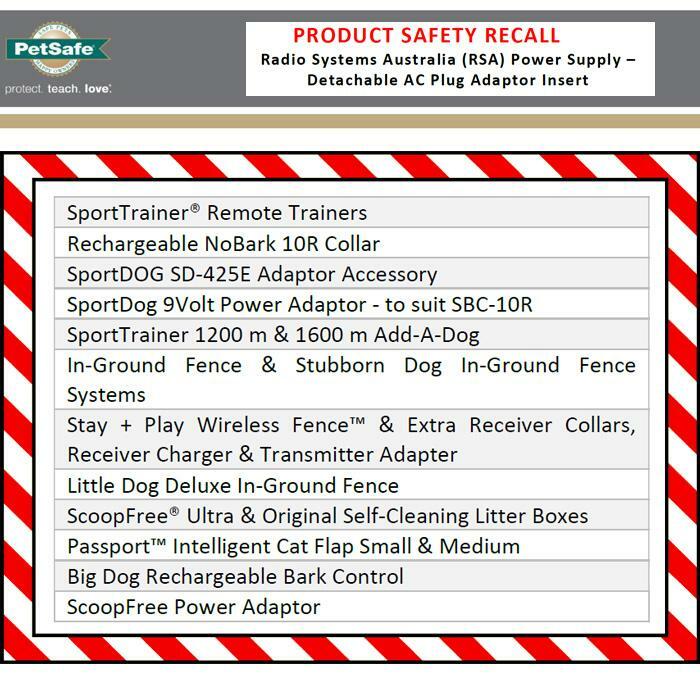 Ltd.
Radio Systems Australia (RSA) has been alerted to a serious safety issue with some of their power adaptor plugs and urgently need your assistance in retrieving these products to keep customers and their pets safe. Select PetSafe® brand and SportDOG® brand products dated 2009 to 2016 in Australia and New Zealand have a manufacturing fault that causes their inserts to break apart while being unplugged from a power socket. This can expose live parts and cause a dangerous electric shock. RSA has said it is critical that customers who suspect they might have a PetSafe® brand or SportDOG® brand product manufactured between 2009 and 2016 do not attempt to unplug the adaptor insert. Customers should call RSA immediately on 1800 786 608 or visit their website at http://www.petplugrecall.com.au to receive important instructions and support to remove it safely. Once customers have reported their product, RSA will send a new plug insert to them within days, and they will be able to safely use their product again. RSA will be sending replacement plug insert to the owners of all their impacted products dated 2009 to 2016, regardless of whether the individual product appears to have a fault. In the meantime, retailers are being urged to remove all affected products from shelves for their customers own safety. RSA regrets any inconvenience that this has caused and are taking the greatest possible precautions to keep customers and their families from harm. 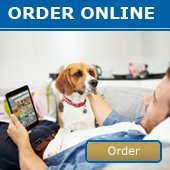 For a list of all impacted products and important safety information, please visit http://www.petplugrecall.com.au or call RSAs product recall hotline on 1800 786 608 for further assistance.